SnowChainsandSocks.co.uk are well established snow sock and chain supplier in the UK providing many snow socks and chains to end users, business fleets and vehicle manufacturers. 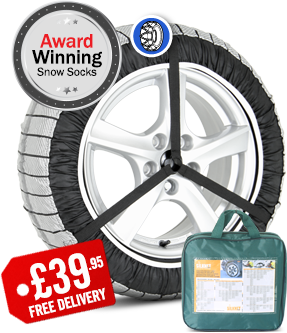 We offer two of the best snow socks products on the market - the Silknet and Trendy snow sock products which have a prestigious best buy award and are used in large fleets all around the UK. Snow socks are a fabric alternative to a snow chain. The main advantage is the ease of fitting, but customers also like them because they do not need much space under the arch of the vehicle like a chain does. Our snow socks are up to 98% as effective as chains. Our snow socks are the best option because not only of the Which best buy award (featuring the highest traction score of any sock) but also value for money; our socks are delivered next day* from only £39.95. With Silknet and Trendy Snow Socks you also get a very sturdy fabric bag and some very useful gloves, our socks are the only socks in the market to have the patented elasticated grip band in the centre of the fabric which ensures the sock fits tightly to the tyre tread, this minimises slip and avoids damage caused by loose fitting that other socks may experience. We also have an open face sock to avoid snow build up inside the wheel, this kind of build-up, over time, could lead to premature corrosion of in wheel components or debris in the wheel components collected by the snow. All of these reasons and more is why our socks are in thousands of vehicles across the UK in the largest vehicle fleets in the country. Simply put - yes! It really is as simple as that for our high quality socks. There has always been some speculation that snow socks don't last very long, but in truth - like chains - they last as long as you use them snow and ice covered roads. Can I use Snow Socks in the Alps? Yes, our socks meet the criteria for use in the Alps where the snow chain sign is shown. What's Better, Snow Socks or Chains? 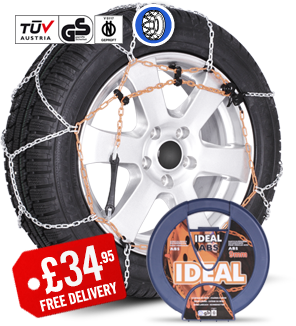 There are lots of reasons to go for either option but the deciding factor is usually the ease and speed of fitting snow socks, or the case for chains is level of grip acheived in severe snow and steep slopes, chains are slightly cheaper too. Our view is that snow socks are easy to fit compared to chains and our snow socks are measured up to 98% as effective as chains, so unless your'e in a lot of snow and a slope, go for the socks. How do I find products that fit my tyres? Simply find your tyre size on the sidewall and enter it in the boxes below. We will display all the products that are suitable for your tyre size. If you need help reading your size click here.